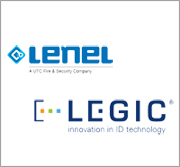 Lenel Systems International Inc. and Switzerland-based LEGIC Identsystems Ltd, have entered into a license agreement that enables the integration of Lenel’s security solutions with LEGIC’s advant technology for contactless identification. According to LEGIC, the new partners will soon be able to deliver a variety of applications such as access control installations for business and campus sites. Lenel, based out of Rochester, N.Y., focuses on developing products that enable organizations to protect and manage their people, property and assets. With more than 18,000 system installations in more than 93 countries worldwide, Lenel has a customer base in a broad range of vertical segments including health care, government, critical infrastructure, education, petrochemical, manufacturing and telecom.